The mission of the Gwen Cherry Park Foundation is to fully fund an endowment to guarantee adequate funding at the NFL YET Miami thereby insuring financial support to the academic, health, cultural, social and athletic programming at the NFL YET Miami in perpetuity. The youth who participate in programs at the NFL YET Miami at Gwen Cherry Park have dreams to become great members of our society. The Gwen Cherry Park Foundation provides funding to support positive programming for the youth to "Say Yes!" to. WPLG spotlight on the dance program at NFL YET Miami at Gwen Cherry Park. Miami-Dade County Commission Board Chairman Jean Monstestime honored the Gwen Cherry Bulls and team members for their win of the national Pop Warner Super Bowl. 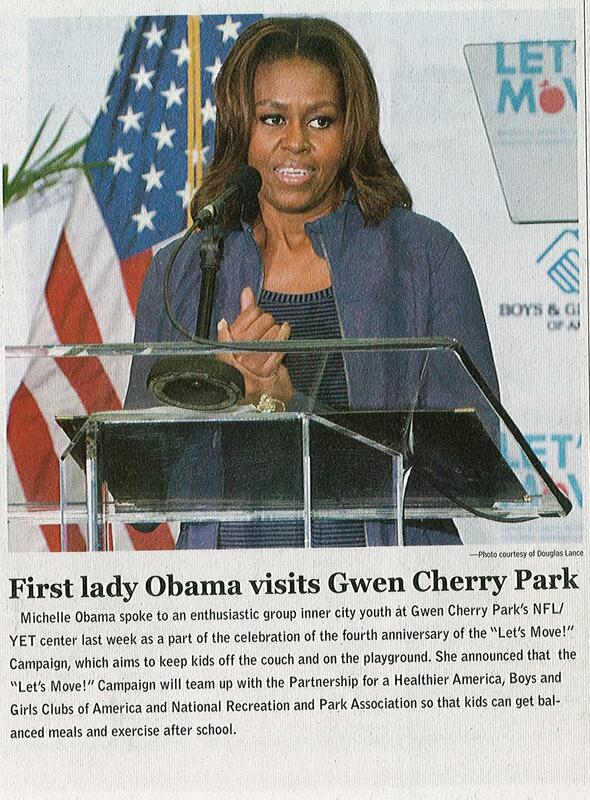 First Lady Michelle Obama celebrated the fourth anniversary of her national "Let's Move" campaign at the NFL YET Center Miami and afterwards participated in fitness sessions with the youth at Gwen Cherry Park. As one of the winners of the Miami Foundation's first Public Space Challenge, the Gwen Cherry Park Foundation received funding to provide a shade canopy over an outdoor fitness zone in Gwen Cherry Park. Hundreds of youth participate annually in the programs at the NFL YET Miami at Gwen Cherry Park. The Gwen Cherry Park Foundation has provided funding for activities such as fencing, etiquette and hygiene classes. With future support, it can fund similar classes for fun and youth development to supplement the programs and activities currently offered. This year, the Gwen Cherry Park Foundation provided funds for the youth to have a graduation ceremony to celebrate their achievements in school and participation in the NFL YET Miami programs. The NFL Youth Education Town of Miami (NFL YET Miami), is the home of the four-time national Pop Warner Super Bowl champions Gwen Cherry Bulls. The Gwen Cherry Park Foundation provides funding for the teams to participate in regional and national championships. The Gwen Cherry Park Foundation provides funding for after school and summer and winter break activities to enhance the programs offered at the NFL YET Miami at Gwen Cherry Park. Annually, the Gwen Cherry Park Foundation, provides funding for the NFL YET Miami's Christmas Festival with rides and toys passed out to youth participating in programs at the park. It also provides funding the park's Thanksgiving dinner, which includes over 300 youth and their families.